On May 31st we all cheered at the inauguration of the first phase of the SGR from Mombasa to Nairobi. Now Kenyans can travel between the two largest cities quickly and cheaply. Accelerated movement of cargo and people will mean more trade, more income generation, and therefore, more jobs, and that’s good for our youthful nation. 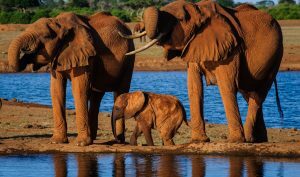 Much less widely reported were results of studies by Dr. Joseph Ogutu and colleagues at the International Livestock Research Institute (ILRI), which reveal that Kenya’s wildlife numbers are plummeting. Some of our most treasured animals, such as hirola, rhinos, cheetah, lions, and giraffe, are being pushed to the brink of extinction. Nearly every region and habitat in the country is in trouble, except Laikipia. But even here, hard-earned conservation gains of past decades are in danger of being wiped out in a single year of drought and conflict. One Laikipia ranch claims to have lost a 70% of its wildlife in a single year. Tourism accounts for over 12% of the nation’s GDP and employs over 300,000 Kenyans. As a mainstay of tourism, wildlife is a key driver of the economy. Despite this, it seems that wildlife conservation is increasingly misaligned with Kenya’s key development priorities: jobs, food security, ending poverty, health care and education for all. To those in the halls of power who decide what matters and what doesn’t, all of these goals are ultimately tied to a vision of Kenya becoming an industrialized nation. This is the unquestioned goal of our vision for 2030. What an industrialized nation looks however needs to be defined as an image that includes all the trappings of advanced infrastructure and systems: institutions that function efficiently, a democracy that works, a healthy environment with effective waste management, adequate water and clean energy, and liveable cities with open spaces to serve the social and mental needs of the people. An industrialized Kenya will still need wilderness and natural forests to soak up carbon and release fresh air and clean water, and parks and reserves to safeguard our unique natural heritage. Our recent history shows the danger of ignoring the value of nature to our health and wealth. The country is hurtling along an accelerated course of development that is blind to the environmental damage it causes, dodging conservationists as if we are potholes on the road in an imaginary race to a finish line. This is a route that leads to pollution, rivers clogged with plastic waste, habitat loss as rural landscapes are built on or converted to agriculture, and massive infrastructure developments across our wildernesses. The damage caused by the poor planning of dams, farms, ports, roads and railways is rapidly outpacing our ability to respond. Floods and droughts are causing more deaths than ever; traffic congestion threatens gridlock in our cities; air pollution in Nairobi is among the world’s worst. Chemicals are distributed like candy to farmers – it’s no surprise that Kenya has one of fastest rising rates of cancer among young people. The growing mental health problem is something we haven’t even started talking about. What’s most troubling is our collective failure to respond. It seems that Kenyans no longer value or aspire to healthy environments. We don’t even notice that there are no more clean-flowing rivers, or know that we are losing the biodiversity in our natural forests. We might notice that it’s getting hotter and drier and plant a few trees to feel good, but we don’t stop the illegal logging – it’s too much effort challenging the authorities when there’s no political will. So we also ignore the trucks that are dredging up sand and destroying our rivers and turn a blind eye to the dumping of waste on roadsides and into the city streams. Those who can afford to fence themselves off from the mass of humanity, hiding the poverty and filth on their doorstep, travel to faraway places to enjoy fresh air and stunning sunsets. Surveys reveal that most Kenyan youth see wildlife as irrelevant, something that benefits a few, rich visitors or white landowners. The disconnect between people and nature allows influential people to argue conservation is an outmoded western construct that has no place in modern Kenya. Conservation organizations are marginalized and reduced to fighting rear-guard actions on the streets or in the courts. But we are also to blame, since we have failed to respond with a clear vision that makes wildlife conservation relevant to all Kenyans and provides opportunities for them to participate in achieving it. It is not too late. We can change the course of history by reconnecting our people to nature. This week the Ministry of Environment and Natural Resources launched a consultation exercise intended to provide guidelines for a new wildlife strategy. I urge all Kenyans to take this rare opportunity to articulate a future in which each of us is a part of the solution. Conservationists will need to make compromises in order to reach agreement among the most important stakeholders – landowners, communities, businesses, and the tourism sector – around an approach of conservation that is compatible with the national development agenda. We should seize this opportunity to regroup around a new vision of conservation that all Kenyans can aspire to. Elephants from Tsavo National Park, one of the oldest and largest parks in Kenya.